Friday, September 5, 2014Zillow Mortgages' current mortgage rates in Washington for mortgages remained stable at 4.02%. State mortgage rates today ranged from the lowest rate of 4.00% (NC) to the highest rate of 4.19% (HI). 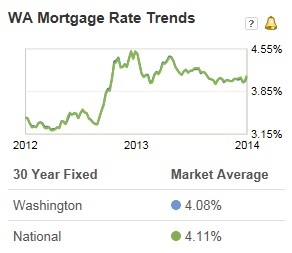 Washington mortgage rates today are 3 basis points lower than the national average rate of 4.05%. The Washington mortgage interest rate on September 5, 2014 is up 3 basis points from from last week's average Washington rate of 3.99%.